"improvisation", "process", "quilts", improvisational piecing, "circles"
When I posted some photos of these little curves the other day a non-quilting friend asked me if I was making another version of the quilt. Because she remembered me working on them last year. Nope, same quilt. More piecing. I pulled this project back in to the rotation last week. After so many scrap projects of late it is nice to be working with a controlled colour scheme. Not that the piecing is any faster with these itty bitty curves! I guess this was the itch that needed to be scratched. Many times I’ve been asked how big I plan to make this quilt. The answer is always “Until I run out of fabric.” Of course, since I am working with solids I could replace them. Frankly, I’ve done that once already. But even I have limits and will likely stop once this round of fabric is done. In actuality, the supply of yellow fabric is getting low so I guess that will be my limiting factor. As it currently stands, the pieces for the top make it about 40’’ x 60’’ . As the fabric supply dwindles I’ve decided to focus on making the little blocks instead of assembly. I have absolutely no idea how much bigger this can and will get. My little plastic baggies are filled with the size sorted blocks, like some sort of quilting drug deal. Every time I sew, press, square up, and add to the collection my potential finished quilt gets an inch or two bigger. By sewing all the blocks now I will ensure that my colours stay balanced across the entire finished quilt and not have a portion where there is no yellow, for example. So I will sew all the blocks first then sew them all together. Fingers crossed this leaves me with a functional sized quilt. It’s been precisely 2 years since I started this project in a class with Chawne Kimber. At the time it was a fun experiment, a good way to play with one of my idols in the room guiding me. 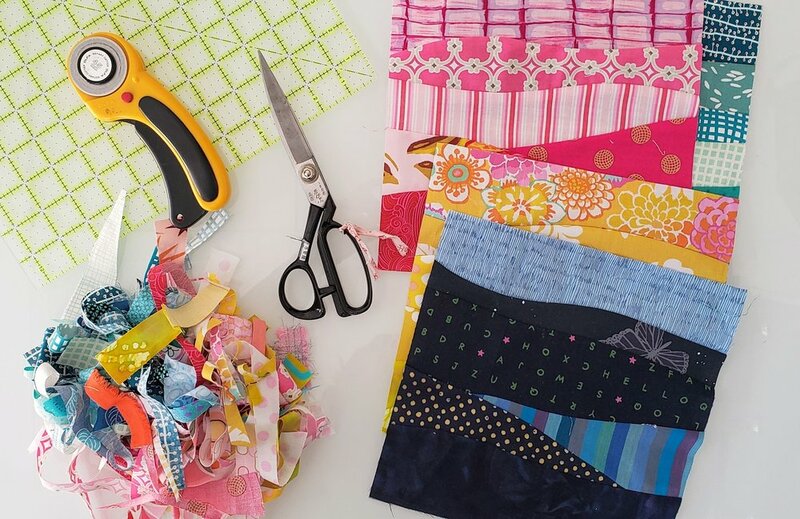 There is no rushing tiny piecing, especially when you want the finished result to be large enough to cover a lap and not just a wall. There is also an inherent boredom in tiny piecing, especially when making something larger. It is a A LOT of repetitive action. If it takes me a few years, it takes me a few years. I am thoroughly engaged in the process when I am doing it and have no problem letting my interest ebb and flow. I’m floating down a slow river and the ride is good.